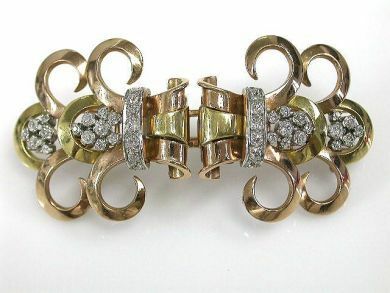 One platinum and 18 karat yellow and rose gold retro detachable brooch. Twenty-eight old European cut diamonds (1.64 carats: SI2-I1 clarity: H-I colour). Fourteen old European cut diamonds (0.78 carats: SI2-I1 clarity: H-I colour). Please inquire please make an appointment to see this item.